There is a playful element to this card, but there is also a slightly sinister aspect too; an issue from the past that we thought we had dealt with can present itself when this card appears. Every now and then something from the past revisits us, sometimes turning our world upside down and sometimes forcing us to re-examine things in a whole new way. This is the astounding tale of a fish known as coelacanth (seel-uh-kanth) that was thought to have gone extinct with the dinosaurs, 65 million years ago. Unexpectedly one such fish made its appearance in fishing nets off the coast of South Africa in 1938, and it was very much alive! Fondly referred to as ‘Old Four Legs’ and the ‘Living Fossil’ the coelacanth quickly became the continuing obsession of journalists, biologists, scientist, explorers, aquariums and divers. The coelacanth fascinated the world and ignited a debate about how the bizarre lobe-finned fish fits into the evolution of land animals. According to National Geographics, Many scientists believe that the unique characteristics of the coelacanth represent an early step in the evolution of fish to terrestrial four-legged animals like amphibians. The most striking feature of this "living fossil" is its paired lobe fins that extend away from its body like legs and move in an alternating pattern, like a trotting horse. Despite initial reactions that this was a hoax or a once-off wonder, a community of these coelacanths was discovered near the Comoros Islands near South Africa and another in the waters off Sulawesi, Indonesia. Studies in the Comoros suggest that only about a thousand remain there, and are today considered an endangered species. Here’s the thing that we have to ask ourselves though, did evolution stand still? This fish should have evolved onto land many millions of years ago. Why didn’t the coelacanth evolve? But more importantly, based on these findings we have to ask ourselves whether there are other prehistoric dinosaurs or ‘monsters’ like the Loch Ness for example around today? For all we know there are living, fire-breathing dragons lurking deep beneath, just waiting to be discovered. 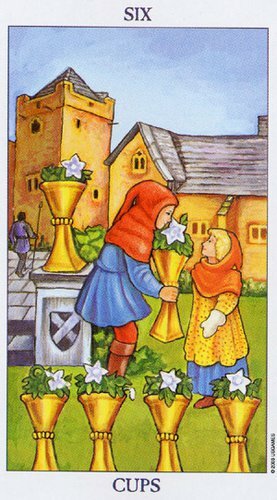 Yes, there is the playful element of the card rearing it’s head again, but in light of these findings it is not all that inconceivable any more, is it? Sometimes things come back from our past. Things that we have forgotten about or that we thought we had dealt with, often these turn our world upside down, or forces us to look at things in a whole different way. 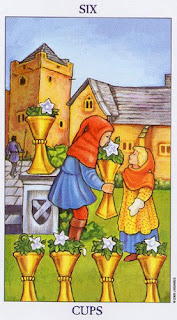 This card reminds us to allow playfulness into our lives, but it also prompts us to ponder whether those issues we thought were dealt with for once and for all have really been laid to rest. There are times, as Carl Sagan said, that we have to know the past to understand the present.